Students took the Global History and Geography Regents last week. 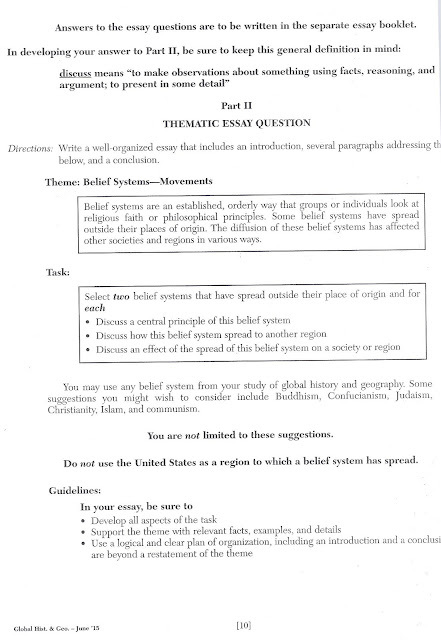 In addition to fifty multiple-choice questions and a document-based essay with short-answer scaffolding, students had to write a thematic essay on belief systems. They had to discuss a central belief of two systems as well as the spread of each system and its effects, once transplanted. Some teachers were relieved. They had guessed the question correctly. They had given a similar question on their final. They had reviewed the topic a day or two before. I was a little less lucky. I reviewed the topic a month and a half earlier...when we were first asked to begin our review. I had not tested the same topic on the final. I had not reviewed it again, a day or two before. Looking on the bright side, if I hadn't reviewed it with them at all, they would have either needed to remember it from two falls back--when they were ninth graders--or from their own self-regulated review. The latter doesn't happen much these days. As we all know, it is one day of testing that is supposed to reflect best on our full year of teaching and the totality of knowledge absorbed by our students. And besides needing to review like crazy to (ironically) try to prove that we are good teachers, we need loads of luck to correctly predict essay topics. Some of my colleagues pat themselves on the back. They mentioned this or that which their students can use as outside information for the DBQ. I know better. You know something and you mention it, but the test is not measuring the teacher. The test is measuring the brain of a sometimes distracted teenager. It was important to you that you mentioned "x," but it went in one ear of your student and out the other. Your students were dreaming about "y." It's probably a heck of a lot more interesting! Despite the optimism of the most optimistic, most student essays will leave something to be desired. 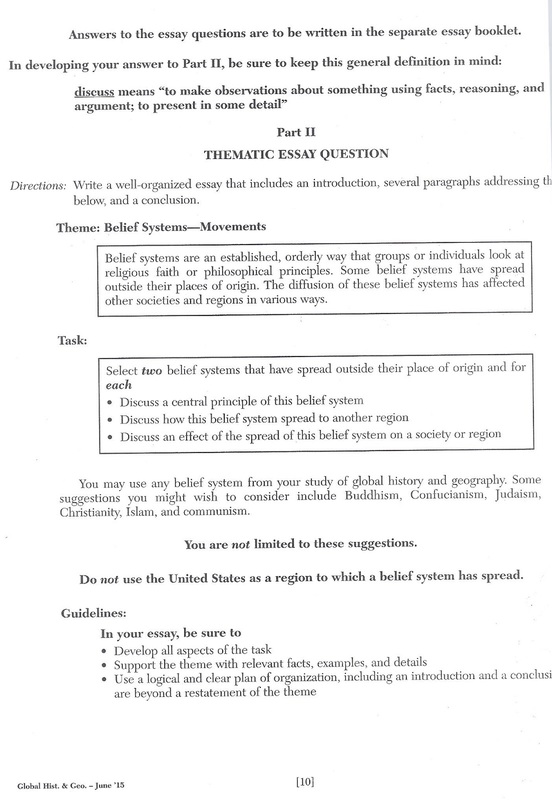 Many kids may be able to explain a number of tenets of each religion, but the thematic question demands a discussion of the spread of the belief systems. Here, I know students will sadly fall short. It's not that we failed to teach them. We merely failed to focus upon what the test makers chose to focus upon this year. If we focus upon it next year, the test makers will have already moved on to something else. Will we be able to guess it? As the forces of "reform" fight to revoke tenure, the challenging nature of future Common-Core aligned exams may soon prove in a single day of testing (just three-hours time) that we are all failures, worthy of being held back or fired. But for now, it's June. The summer vacation will soon be upon us. You've done the best YOU can do. And you've even tried to spread the word about the stupidity of this system. So, let's live for today...while the Governor and his supporters in Albany try to find new ways to eliminate our tomorrows! "Sha-la-la-la-la-la, live for today and don't worry 'bout tomorrow..."